Well, that’s the way it looks in the Western Pacific, as respected Japanese lure-maker Jackall seems to have forgotten all about the roots of its newest bait, the Pompadour. Even before WWII in the Pacific, James Heddon’s Sons already had this bait–only they called it the Crazy Crawler. 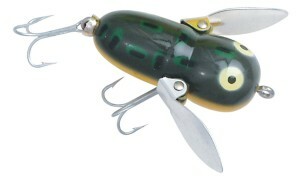 From the photos you’ll see the 1939/1940 design from the venerable American company retains eerie similarity to the bait just unveiled from Japan. 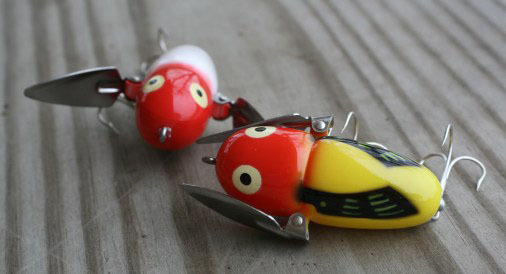 True, the original Crawler was made of wood, yet most anglers today would recognize the plastic version–if for no other reason than its quirky metal “wings.” Knit pick if you like about the [Pompadour’s] tail prop; this is a colder knock-off than Madonna doing Norma Jeane. 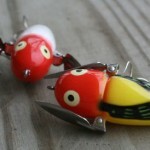 Still, anyone with a tackle box knows that before Gene Larew or more recently Z-Man Lures’ litigation, the fishing industry almost never blinks when it comes to copy cats. Apparently that legal action must have been an anomaly. CALL ME CRAZY… but we’ve had these for decades. Yet, some may argue the idea of a better mouse trap (if truly better at three times the price) is a more compelling notion. *Thanks to reader Mike Jones for stoking the fire on this story. This entry was posted on Friday, October 31st, 2014 at 2:40 pm	and is filed under News. You can follow any responses to this entry through the RSS 2.0 feed. You can leave a response, or trackback from your own site. Thanks, George for giving my rant wings. Well done! 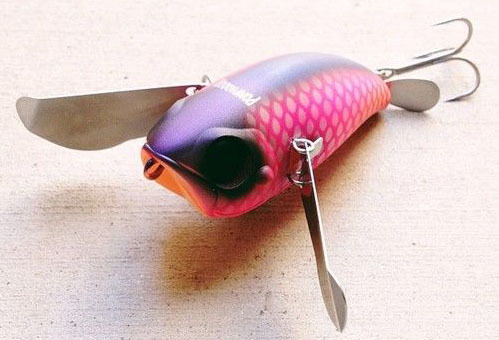 Let’s face it, after a certain point in lure making history, the true innovations only emerged as the result of true innovations in materials and production. (Think plastic injection molding, for instance.) Everything else is a version on a theme. In this case, however, the Jackal Pompadour takes this understood “sharing” of ideas to a whole new level of shamelessness. As they say, “Those who ignore history are bound to repeat it”, except in fishing where “Those who ignore history are bound to steal from it.” And, by the way, isn’t the jackal an opportunistic predator/scavenger that grabs what it can when it can? At least one part of the company presentation is aptly named. Thanks George, since I fished the Crazy Crawler growing up I am once again reminded of how old I really am. Nuts! New and improved rip off ? Shaking my head…….